PHOTO: Allen Ramsey, DWCPhoto.com. Highlands senior wide receiver Mitch Cain (16) goes airborn to score on a two-point conversion while Jared Dougherty (10) blocks. Cain returned from injury in the 42-7 Bluebird win. PHOTO: Allen Ramsey, DWCPhoto.com. Highlands senior defensive back Austin Beal (27) tackles Dixie Heights running back Ethan Schulte (30) while teammates including Bradley Greene (86) help out. Especially with the last four opponents in the regular season struggling with a combined 5-19 record, the Highlands Bluebirds knew they could still put together a special season despite their first 1-5 start since 1939. 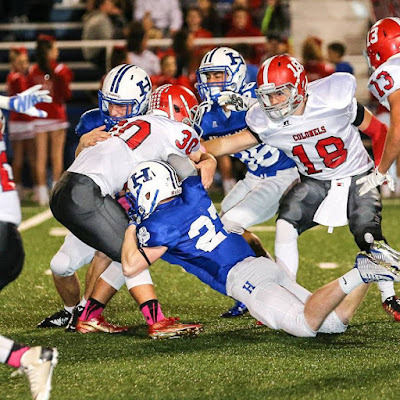 After taking care of the Dixie Heights Colonels on Friday to open Class 5A, District 5 action, Highlands (2-5 overall, 1-0 district) has a chance to see the other two district opponents on Saturday at 1 p.m. The Grant County Braves (3-3) battle the Covington Catholic Colonels (1-5) in Park Hills. After facing those two, Highlands takes on the Boone County Rebels (0-6) in Florence. The Rebels own just two victories since winning their last region championship in 2011. 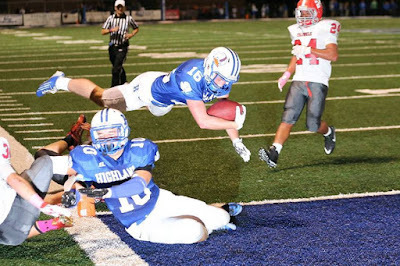 Highlands had not played Dixie Heights since 2011 when the Bluebirds dominated the Colonels, 61-7. The Bluebirds moved to 63-8 all-time against the Colonels with their 12th straight win in the series dating back to a 21-14 Dixie Heights win in overtime in 2002. Highlands and Dixie Heights were also district opponents with Covington Catholic and Scott from 2007 to 2010 in the same class and district. The Bluebirds beat Dixie Heights six times during that span including the 2009 and 2010 runs to the 5A state championships led by current University of Kentucky quarterback Patrick Towles. Highlands senior wide receivers Mitch Cain and Chandler New returned to action after missing games because of injuries. Cain had not played since the season-opener against Cooper and New missed the Simon Kenton game. The two had touchdown receptions in last year's Class 4A state championship win over Owensboro. Cain was the team's leading returning receiver from last year with 28 catches for 464 yards and four touchdowns. Cain had two catches for 14 yards against Cooper and New had 12 for 133 yards and a touchdown on the season entering the game against Dixie Heights. "It was great to be out there and be able to help my teammates," Cain said. "It's been rough having to sit there and watch, but I've been doing everything I can to help everybody. This week was awesome being able to come back, especially to pull out a big win like this." Highlands also saw junior offensive lineman Kyle Finfrock return. He also missed the Simon Kenton game because of injury. The teams that District 5 will be paired up with in region action in the first round of the playoffs saw the Madison Southern Eagles and Anderson County Bearcats come out victorious in the first week of district play. Madison Southern (2-4) beat the Montgomery County Indians (4-3), 33-13 and Anderson County (4-3) beat Woodford County (3-4), 35-26. North Laurel remained the only undefeated team in the class at 8-0 with a convincing 51-0 win over Letcher County Central (4-4) in District 8 action. The Jaguars could win the district outright with a win at Perry County Central on Friday. North Laurel then has its bye week before finishing the season against Montgomery County. The only team the Jaguars beat that has a winning record is Whitley County (4-3). Eight teams have just one loss including the defending 5A state champion Pulaski County Maroons (6-1) and Bowling Green Purples (6-1). But the two have huge district games coming up against in-county rivals with similar records. The Maroons will be heavily favored to beat South Laurel in District 7 action before facing the Southwestern Warriors (6-1) on Oct. 23. The Warriors will also be heavily favored Lincoln County on Friday. Bowling Green faces Barren County (2-5) on Friday before taking on the Greenwood Gators (6-1) in District 2 action. Both games could decide district championships. The lone losses for Pulaski County and Bowling Green also came against teams that beat Highlands. Scott County beat the Maroons, 53-31 on Aug. 28 in Georgetown and Louisville St. Xavier beat Bowling Green, 45-19 on Sept. 4 in Louisville.